This book isn’t even set in summer, and I still think that it embodies all that’s good about summer: the love, the happiness, the family, the togetherness. Maybe it’s because all of Matson’s other books are set in summer, maybe it’s that this book was released in summer, but still – this book is the perfect summer read. 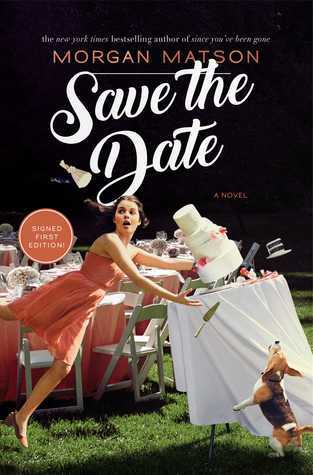 I’ve never actually read a book about a wedding before, so I was a little surprised to see Morgan Matson – YA author supreme – writing about quite an adult affair. It just didn’t seem like an interesting premise to me – me, who wanted an easy, beachy read about teens falling in love, the kind of book Matson usually delivers. But I gave it a shot anyway – I mean, it’s Morgan Matson. And no regrets – I loved this book! What I thought would be a little tedious of a plot turned into a roller coaster filled with twists and turns, ups and downs, and made for a story I was equally excited by and enamoured with. Matson’s distinctive writing style and characterisation skills pulled me in right from the off, and I couldn’t stop reading! I actually read this book in less than 2 days. That’s how invested I was, and simply how enjoyable it is. Matson did so well at creating a whole cast of distinctive and entertaining characters that the reader could really get behind. My only criticism would be that I kept forgetting their names – but that’s more my fault than Matson’s! There was just so many characters both to fall in love with and to love to hate, which really helped generate the ‘chaotic’ feeling Matson seemed to have been going for. Certainly, I could imagine this being both a stressful weekend, yet also the most fun to be a part of. Furthermore, it was so easy to imagine this book on a screen. At times, I honestly felt like I was reading a screen play, with my own laughs serving as the laughing track. Because Matson actually made me laugh out loud multiple times over the course of Save the Date, which – again – I wasn’t really expecting. This was certainly bolstered by the range of distinctive characters, the chaotic feelings throughout and the really well-managed pacing. It would have been so easy for Matson to linger too long on some parts, skip over other parts too quickly, but I believe she managed the perfect balance. I’m usually quite intimidated by Matson’s typically hefty chapters, but in Save the Date, the chapters were the perfect length, and lead onto one another seamlessly. This book should definitely be optioned for the big screen, or even for Netflix like Jenny Han’s To All the Boys I’ve Loved Before. I would just love that. This is maybe most family oriented book I’ve read by Matson so far, which I didn’t expect to love as much as I did. Of course, there’s an undercurrent of romance – but in general, this book is a bubbling brook of wholesome family love and appreciation. Actually, this is probably my favourite book of Matson’s so far, which is a real surprise. It was also really nice to see quite a modern take on this wedding idea. It was based in the family home, it was non-religious, and the main celebrations were of love and family, not of the bride’s dress cut or the cake. Overall, I actually don’t have any criticisms. This book was lovely, wonderful, amazing, exciting, fun, hilarious, adorable. Need I use any more adjectives to persuade you to read this book? To read my reviews of some of Morgan Matson’s other books, click below! omg, this book would be SUCH a great movie. I know right!! I need someone to option it for the big screen ASAP!! !